Returning to civilian life after serving in Iraq and Afghanistan, a growing group of veterans find refuge through art and farming. Republished from Fresh Dirt Ithaca. Nathan Lewis in the greenhouse. 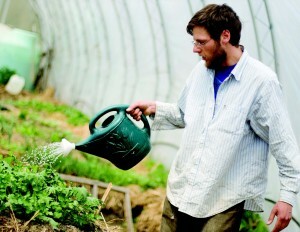 In a humid greenhouse on the backroads of Trumansburg, Nathan Lewis, a 28-year old veteran of the Iraq war, weaves through a maze of of tables, hoses, and water tanks, pointing out the various plants he and other members of the Veterans’ Sanctuary are cultivating this year—chives, licorice, a hardy citrus tree, a hardy kiwi, a curling willow. It’s an odd selection for upstate New York, but the veterans, who get most of their plants by donation, fill pools of water in the greenhouse to keep the air humid for the nonnative species. Despite their efforts, they can’t seem to solve their mouse problem, which raises the question: How does a peaceful, antiwar group like this one deal with pests? The Veterans’ Sanctuary, which was set up to help soldiers returning from the wars in Iraq and Afghanistan acclimate to civilian life, is a recent addition to the list of project partners at Cornell’s Center for Transformative Action. Located in an Italianate house on a hill overlooking the village of Trumansburg, the sanctuary endeavors to create a new model for healing from war trauma—one that involves peer support, reconnection with nature through farming, and a connection to self-expression through art. Tall and willowy, with a thick shock of hair that falls over his forehead, Lewis joined the Army just out of high school. “I went to see a guidance counselor and I wrote that I wanted to go to college and work on computers. I spelled both ‘college’ and ‘computers’ wrong, and they sent me to the Army recruiter’s office,” he says, laughing. Aside from farming, the sanctuary also supports the Combat Paper Project, wherein veterans pulverize their old uniforms into a pulp to make paper that they then use to create art. 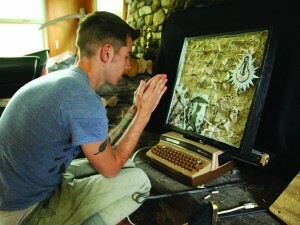 Last spring, they exhibited their work— paintings, sculptures, collages—at the Ink Shop in Ithaca. Chris Arendt, at the Veterans’ Sanctuary, with one of his sculptures. Paper making, he continued, helps vets calm their anxiety by channeling the discipline they learned in the military into something creative rather than destructive. He gestured toward one of his sculptures: a pale blue medicine cabinet filled with pills and pill bottles from the VA. Across the mirror on the front of the cabinet Arendt had scrawled, “Good Morning, PTSD.” The piece is called It’s Going to Be a Good Month This Month. . . . The very moment Bush shouted “Democracy” Turkey nodded in agreement and closed the gate . . . Think hard and imagine if you can, the thousands of lives saved on both sides; conscripts and civilians . . .
For . . . the rocket cluster bombs I hauled killed with terrible indiscretion. As for the mice and other animals, the veterans are still trying different methods of keeping them out of the greenhouse. Right now they leave a boom box playing at night to keep the mice at bay. Lewis leans down to check the music. This entry was posted in Republished and tagged farming, Iraq, military, post traumatic stress disorder, sanctuary, veterans, war by hannahrenglich. Bookmark the permalink.